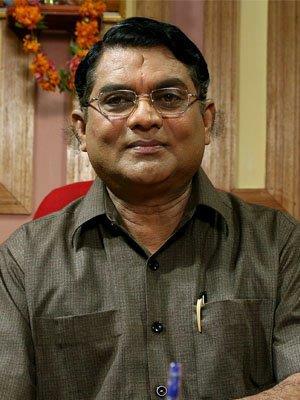 Mathru Vandhanam malayalam movie directed by M. K. Deva Rajan will have Jagathy Sreekumar and Sukumari in lead. Scripted by Madambu Kunjikuttan, the movie is blessed with the presence of K P A C Lalitha, Madambu Kunjikkutan, Saiju Kurup, Sunil Sugatha, Sivaji Guruvayoor, P J Radhakrishnan, Murukan, Urmila Unni, Baby Jesina and Jayadish. Mohan Sithara is in charge of the background score. Produced under the banner of Bharati Films, the movie would reach theatres soon. A movie featuring Jagathy Sreekumar and Sukumari in lead is getting ready for release. Titled 'Mathru Vandhanam', the movie directed by M. K. Deva Rajan is based on a heart rendering real life incident which happened in Thrissur. The movie is based on the love and sacrifice rendered by a mother while protecting her mentally challenged son. The story revolves around the life of Saraswati Ammal and her son Raju. Saraswati Ammal (Sukumari) and Raju (Jagathy Sreekumar) lives with Saraswati Ammal's daughter in Mumbai. Being a clear person at his younger age, Raju lost his smartness and become mentally retarded. For this reason, he was send out of his sister's house. The aged mother runs after the son as he becomes violent and later cheer up him and makes him sleep on her lap which makes a painful sight to the people living around. The biggest pain of this mother is the thought about who will take care of his son after her death. As the mother finds it very difficult to make an earning living with her son forms the crux of this heart touching movie. The movie is a virtual representation of the struggle made by a mother for survival. Scripted by Madambu Kunjikuttan, the movie is blessed with the presence of K P A C Lalitha, Madambu Kunjikkutan, Saiju Kurup, Sunil Sugatha, Sivaji Guruvayoor, P J Radhakrishnan, Murukan, Urmila Unni, Baby Jesina and Jayadish. Mohan Sithara is in charge of the background score. Produced under the banner of Bharati Films, the movie would reach theatres soon. For the lyrics of Sreeram, the tunes are set by Mohan Sithara. The camera was safe in the hands of M.J. Radha Krishan. It would also be a golden chance for the movie lovers to enjoy the emotional act of two big screen legends who had contributed much for the malayalam film industry. The shooting of the movie which was finished years back is expected to reach the theatres in June 2014.